Water, apart from shelter, can become the most immediate need in a survival situation. Drinkable water is a vital resource. Depending on the level of activity, and ambient temperature, a person can live about 3 days without water. Prolonged activity without proper hydration coupled with malnutrition will quickly lower chances for survival. Finding a way to create and maintain a source of clean drinking water is essential for both short and long term emergency preparedness. Whether you find yourself lost in the wilderness or in an urban emergency scenario such as Katrina and Toledo's water crisis, water is life. Just one day without this precious fluid and we begin to see the symptoms of dehydration. Note: For the scope of this article we will concentrate our attention to finding and purifying water while on the move. If you are interested in reading about longer term water purification for a larger group, please make sure to take a look at our emergency water purification article and video. Whether you are on a backpacking trip or find yourself in an unplanned emergency situation our first goal is to locate water. Depending on the location this may prove more difficult than ensuring it's potability. Make sure you are familiar with water sources in the area you plan to travel. Looking at topographical maps is always a good idea. Depending on the dates of the map this could help you find water while backpacking. As with other areas of emergency preparedness, make sure to have a backup plan. Water sources can change with time and seasonal changes. Another important aspect of finding water is the lay of the land. Learning the elevational changes of the area and thinking which way the water would travel during a rain can be another way to locate a water source. For the scope of this article, we will assume that a source has been located. You do not want to wait until you are thirsty to begin gathering water, as the urge to drink directly from the contaminated source can become unbearable. Due to the negative effects of drinking water contaminated with Giardia and other bacteria/viruses, this is a bad idea. Becoming sick from drinking bad water, will further dehydrate you, worsening your situation. MSR (Mountain Safety Research) makes an excellent water bladder. The MSR dromedary series (Dromedary and Dromlite) are puncture proof and can come with handles. Some canteens have a built-in screen to help block large particles. Heavier sediment will make it more difficult to purify the water from contaminants. Another good idea is to use anything from a coffee filter to a piece of cloth to pre-filter the water. This collapsible canteen from the military has a screen that will catch the larger particles. Running water is usually best but if the water is from a still source try to find a place where the heavy sediment has settled. Looking at the chart above we can begin to look at our options and make a choice. As with any other preparedness subject we need to take into consideration what environment we plan on using the gear and the should help define the need. This brings us to the subject of filtration versus purification. There are multiple levels of filtration. As long as the water has been purified properly, filtration at this point would mostly be to make the water more attractive. Since most of us are not used to, drinking water with, leaves, algae, dirt, etcetera. So, at least a minimal amount of filtration is recommended. Since, while you can ingest/digest the aforementioned, most of us would prefer not to. The simplest levels of filtration can be achieved by running the water through a cloth. The tighter the weave of the cloth the better it will filter water, as it will be able to capture smaller/finer particles. Just about any cloth will catch the “big” stuff. Folding the cloth to form multiple layers will help in this process. If you are setting up a long term camp, you can set up a more intricate filtration system, that will not only filter particulates, but also improve taste. That brings us to filtration by manufactured filters. These devices allow us to go into microfiltration and ultrafiltration. By simply running the water through these porous ceramic filters we can effectively remove bacteria and viruses depending on the quality of the filter and the pore size. See chart above. This is where high quality filters such as the Katadyn Combi Filter can filter down to 0.2-micron level capturing Giardia, Crypto, bacteria and most viruses. Some filters are chemically impregnated to ensure complete removal of bacteria. The information below will give more detail. 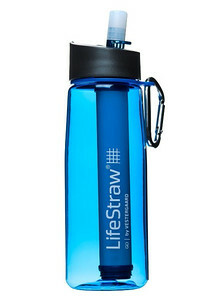 Other commonly used micro filters brands are MSR and Lifestraw. We hope to continue testing on different brands in the near future. Micro-filters such as the MSR Miniworks pictured below remove contaminants from the water using a ceramic filter. The MSR filters down to 0.2 microns utilizing a ceramic filter which should effectively remove most pathogens. We carried the MSR into Yellowstone and other areas and drank out of questionable water sources without any issue. The MSR miniworks contains a carbon core to remove unpleasant tastes. The filters base is designed to screw onto a standard sized Nalgene bottle and the MSR Dromedary bags. Information from Aquamira: "One unit will filter up to 20 gallons (75L) of water. Tests indicate that the Frontier Filter will remove 99.9% of Cryptosporidium and Giardia. The Frontier Emergency Water Filter System is also easy to operate, just attach and expand the straw, submerge the filter end into the water source, and drink through the straw." 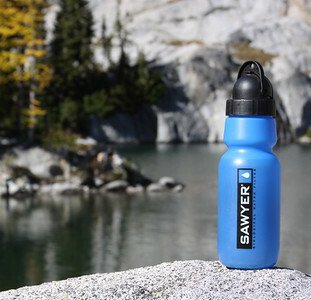 A nice feature of the Sawyer system is the benefit of using the same filter as a water treatment bottle, inline on a hydration pack, as an ultra light drink straw and attached to a faucet with the included faucet adaptor. If purchased with the faucet adaptor kit, it can be configured to drink straight from the tap during boil alerts or in areas of natural disasters such as floods, hurricanes, and earthquakes. The kit also provides hydration pack assembly kit for installing the inline filter on a hydration pack. The Lifestraw go simplifies water purification by allowing users to scoop water from a river or other unsafe water source into the bottle, screw the lid on, and sip clean water through the mouthpiece. 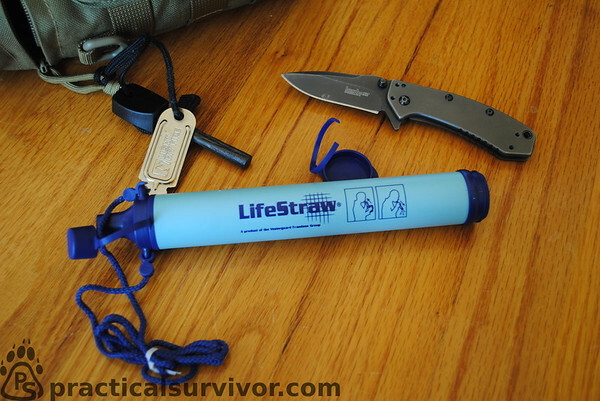 We have not had the opportunity to test the Lifestraw go. We would be interested in comparing it to the Sawyer Personal Water Bottle. Our next post will be a test of the Sawyer bottle. As with any other filter type water purification method, careful attention has to be taken to pathogen/virus and chemicals size. During hurricane Katrina a lot of the water was contaminated with petroleum based chemicals from flooded cars. What is removed from the water is dependent on the filter pore size. However, it is difficult to beat the lightweight option that water purification straws and bottles provide for most situations. 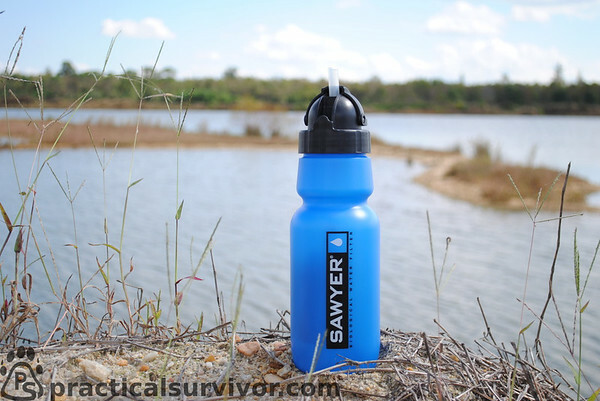 In the article below we test the Sawyer Personal Water Bottle with Filter. The kit we tested comes with a faucet adapter. We are in the process of testing the Aquamira Frontier Pro filter and their military tablets. 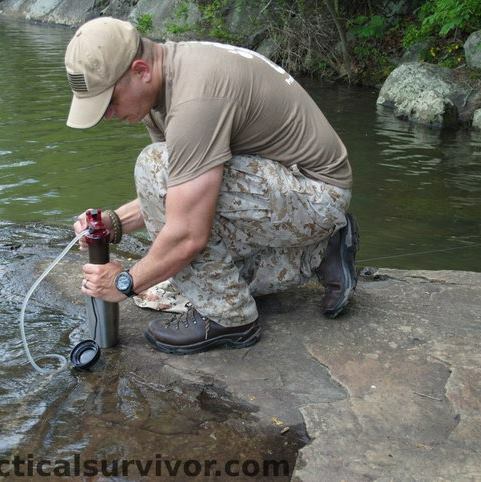 Most water purification techniques are fairly simple. Below are the most common methods of purifying water. Boiling is the simplest method of killing bacteria/viruses. The concept is, that the organism is destroyed by pushing the bacterium/virus past it's heat range. 100*C(212*F) will effectively kill most organisms, not just bacteria. However, boiling will not remove metals or harmful chemicals. Assuming you can get a fire going, and have a metal container. After filtering as many of the particulates as possible. Fill your container with water, place over the fire, bring to a rapid boil, then allow to cool (drinking hot water can induce vomiting). Boiling will kill the harmful bacteria in the water, as they cannot withstand the temperature. Advantage is that you are not adding any chemicals to your water, which takes out the guess work as far as dosage. The disadvantage, if it can even be called that, is that you have to have a source of heat(fire, stove, etc.) in order to bring the water to the boiling point. Also we have to remember that this does not remove chemical such as petroleum or pesticides which can be harmful as well. If the right equipment is available distillation is another way to ensure removal of bacteria and viruses. This is one method that will allow us to use salt water for drinking. Note: If you own a boat and use it for off shore trips a desalinator such as the Katadyn Survivor series would be a prudent purchase. The Katadyn Survivor 40E can be operated manually or using 12/24 V DC power. We will cover makeshift ways of distillation in future articles. 1.the volatilization or evaporation and subsequent condensation of a liquid, as when water is boiled in a retort and the steam is condensed in a cool receiver. 2. the purification or concentration of a substance, the obtaining of the essence or volatile properties contained in it, or the separation of one substance from another, by such a process. Another method of distillation is using a solar still. By placing salt water or contaminated water, we can use the power of the sun to create condensation which is dripped into a container for drinking. Please see our Solar Still article. Some parasites may not be killed using this method. Iodine solutions kill bacteria by upsetting the ion balance within the cell, replacing chemicals that the bacteria needs to survive with iodide ions. Iodine can also be poisonous to humans, and can be especially harmful to young children, and pregnant women. You should be careful not to use too much iodine when purifying your water, and if at all possible avoid using it as a primary purification method for extended periods of time. 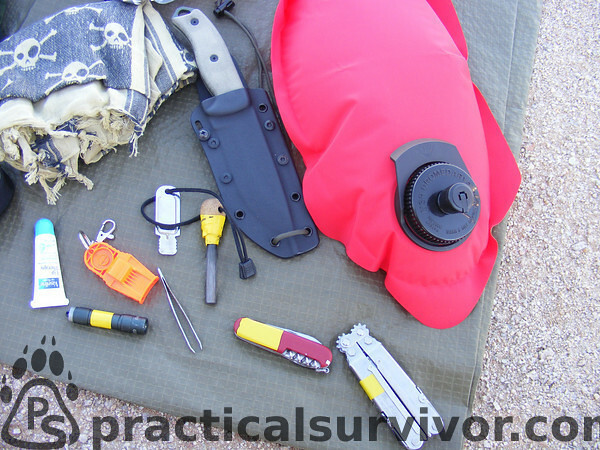 If you find yourself in a survival situation, for an extended period of time, you should consider setting up a still, or boiling the water if possible. Simply fill the provided container with water. Shake the container. Allow the filled container to stand for about an hour. This allows time for the water to become saturated with iodine. Add the iodine to your water container, adding the indicated amount of capfuls (it's about 1 capful to 1 quart). 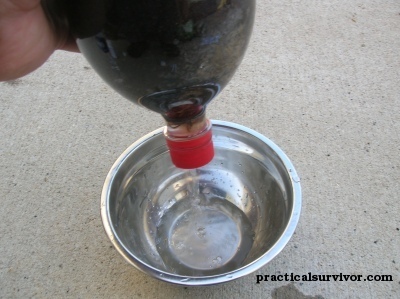 Shake the water container to ensure a proper mixture. Allow the container to sit 20-30 minutes. Afterwards the water is ready to drink. Although we have carried the Polar Pure Water crystals in our packs on several hiking trips and the bottle provided is pretty rugged, the concern for a broken bottle is always in the back of our mind. As a counter point you are carrying an almost endless supply of iodine to treat water makes it a strong option. Iodine tastes just like it smells, fortunately, this is a pretty weak solution, so the taste is not overpowering; it is only slightly worse than city water. The advantages of iodine crystals, is that, one container can treat somewhere in the neighborhood of 10,000 gallons. As well as the fact that, it prepares the water relatively fast. The disadvantage is, as mentioned above, that it is harmful in the long term. Note: Using this method on water from a running stream, proved to have no ill effects on my digestive system. Very common and inexpensive solution. Iodine tablets are easy to use and find. 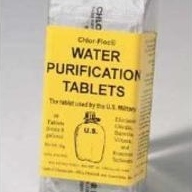 These tablets essentially use chlorination as their method of purification. Sodium chlorite generate chlorine dioxide giving it the ability to treat water. Chlorination, as most know, is a common method of disinfecting water, and is commonly used by municipalities world-wide for this purpose. Chlorine destroys bacteria by destroying the cell walls of the bacterium/virus, killing the organism. Fortunately, when we drink chlorinated water, our digestive system quickly neutralizes the chlorine. So chlorine concentrations along the gastrointestinal tract are, in all likelihood, too low to cause damage. The tablets are wrapped in a metallic foil which makes it easy to store and there are no concerns of a glass bottle breaking. This is one of our favorite items to carry as a backup to our water filtration system. Add one of these tablets to a quart of water. Allow it to sit for approximately 4 hours. Personally, I feel that shaking the container once or twice helps dissolve the tablet more quickly, and improve distribution of the tablet. Water treated in this manner has a slight bleach/chlorine taste, which is less potent than your average city water. The advantage of these pills is their simplicity; add the tab, and let sit. The disadvantage is that you will be waiting for a while before you can drink it. Potassium Permanganate - ( Condy's Crystals or KMNO4 ) can be purchased at hardware stores. Sold as a water softener. Can be purchased in both powder and pill form (permitabs). This chemical compound has many uses from fire starting to water purification. Just a few crystals can treat a quart of water. ( aproximately 0.01% solution) 1 gram per liter (3 - 4 crystals) is suggested by some sources but EPA recommendations are recommended. Although we purchased Chlor-Floc tablets, we decided not to test the tablets. There are multiple sources that evaluate the efficacy of Chlor-Floc tablets. EPA suggestions: You can use tincture of iodine to disinfect filtered and settled water. Bleach - Two drops of bleach per quart 1/8 teaspoon (or eight drops) of regular, unscented, liquid household bleach for each gallon of water. Keep in mind that bleach has an expiration date. Hydrogen peroxide - (untested) During research we found recommended thirty-five to fifty percent concentration being used. Other methods of procuring water or attempting to hopefully decreasing the chances that the water will be contaminated. Many books and articles suggest this method as a safe alternative when lacking water filtration or purification methods. Without testing equipment some methods are difficult to prove. Norseman of Survivology 101 posted two great blogs which include testing done while he trained with the Norwegian school of Winter Warfare. The testing shows that the Mash or Seep showed zero improvement in lowering the bacterial count. Norseman is a retired Marine who held a Scout Sniper Survival instructor position at the First Marine Division, and SERE instructor. Two blog posts go into detail of different water purification methods and their lab tested levels of efficiency. Furthermore, animals have to drink and are known to visit water holes. This raises several concerns, 1) Animals are not very mindful of their toilet etiquette and 2) Predators will sometimes use water holes as a place of attack. If we were desperate, (dying of thirst) and had no way to purify the water, first we really should ask ourselves how we got ourselves into such a situation, then we would have no choice but to drink the water in hopes that we are rescued before the water borne disease kills us. Think outside the box, is there a way to get a makeshift bowl (wood, vegetation) and use hot rocks to boil the water. Is there any material around, bamboo etc that can be used to slowly bring the water to a boil. Build a multiple stage filter using sand, charcoal and sphagnum moss which has been known to contain some levels of iodine. If all that fails then we would be faced with the choice of drinking the untreated water. We know that moving water is preferable to standing water, but what can we do. We can walk around the water source, find the area with the least animal traffic and preferably a sandy shoreline. We can then dig a hole near the water deep enough to allow water to collect. The distance from the water source will have to be judged by the soil we are digging. The hope here is that the water will slowly seep into the hole and begin to collect while being "filtered" by the sand and rocks. At this point we have to get creative to get the water out. Perhaps make a straw out of natural materials or simply soak a bandana and squeeze it into our mouth. This would be a last resort and very risky.